The community of designers, artists, educators and everyday coders, experimenting on algorithmic design. 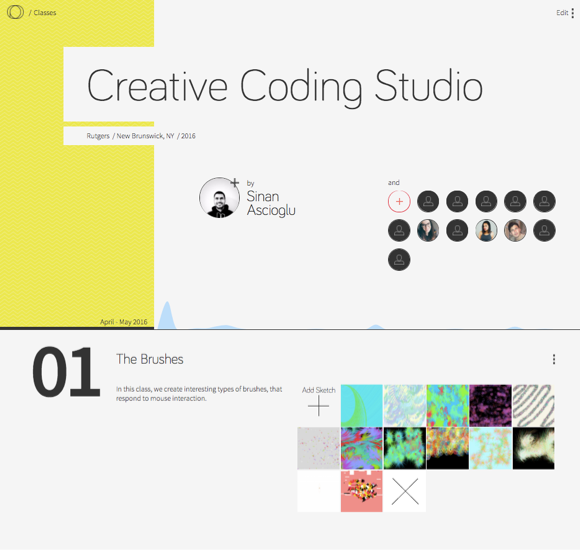 Join 100,000 creative coders and follow their work. 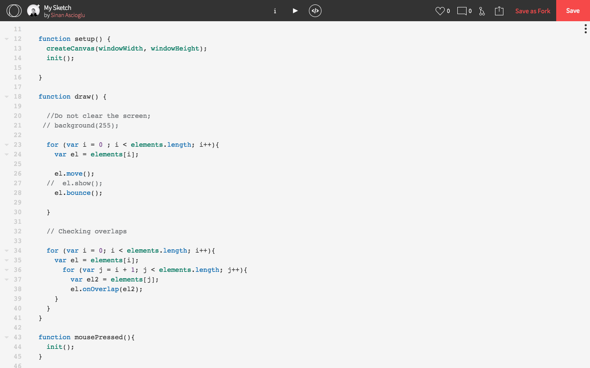 Add your ideas with forks, and find your inspiration for your next coding challenge. Code away your ideas in seconds with intuitive editor and p5js, enable common libraries with ease, and share your work with the community. Teachers exclusive: Invite your students to study coding, give assignments and collect student work on your class page. Nodes that have their own behaviors. They may push or pull each other, connect, kill or give birth, based on position, color, and who knows. Define these set of rules and press Play to watch these particles live their fascinating yet random lives. Take a data point, assign it to a color or size of a shape. Position it on the canvas based on its relation to another data point. When all is said and done, let the visualizations reveal the hidden patterns and tell the story behind the data. Create characters, define game dynamics, and you got yourself a sketch with villain square taking revenge while shooting lasers with unlimited life. Creating games is one of the most fun ways to explore object oriented programming and multi-user interactions on the same canvas. What happens when mouse cursor moves, or you wave your hand to the camera? These sketches experiment with digital painting ideas that uses custom brushes instead of putting paint on canvas. Join the community of 100,000 creative coders to create open source projects, inspire and collaborate. Take your sketches to the next level with premium features and privacy. Upload more files with increased 250 MB limit (standard 20 MB). Use Classroom Platform to invite students and teach coding in class! A quick walkthrough of the exciting world of code, creativity, education, bugs, and Kandinsky. Learn how to use OpenProcessing socket server to create a live sketch that responds to visitors.